“By faith Abel offered unto God a more excellent sacrifice than Cain, by which he obtained witness that he was righteous, God testifying of his gifts: and by it he being dead yet speaketh” (Heb 11:4). “By faith Abel offered unto God a more excellent sacrifice.” Here, faith is connected with sacrifice. If you say that you have faith but cannot make any sacrifice, your faith is dead. The more you have faith the more sacrificial you are. Faith is indeed connected with excellent sacrifice. Abel’s offering was excellent as he offered it by faith – faith made him offer the best and also live the best life (Gen 4:2-4). How do we know that Abel’s life was right with God? “The Lord had respect unto Abel and to his offering” (Gen 4:4). It doesn’t say, “God has respect unto Abel’s offering and to Abel.” In other words, God had respect for Abel’s life and therefore He had respect for his offering. Speaking on the same lines, God did not respect Cain’s life and therefore had no respect for his offering. “By it (faith) he being dead yet speaketh.” This seems to be one of the greatest miracles recorded in the Bible. There were people who had died and were raised to life and Who afterwards spoke, but here is one who keeps speaking being dead! He is still speaking – by faith, by His gifts. Though Abel is dead, his faith is not dead. Faith has a language, a supernatural language, a dynamic language – to speak to any generation of any country. A man who speaks by faith never ceases to speak. He always has a message and an audience. Doubt makes a servant of God dumb for a season – like Zacharias, and faith speaks in all seasons. What is Abel speaking? 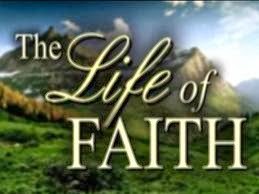 “I lived a righteous life by faith and died for my faith though I had no Bible, no church and no pastors to encourage me. There was no one to set an example to me. My parents sinned and made the whole world to sin. Yet, looking to God alone, I lived and died by faith.” What excuses have we, if we don’t live by faith and make a sacrifice by faith?